Can acupressure balance your emotions and get rid of depression? Before we discuss treating depression with acupressure techniques, it is important to learn about the different types of depression and different sources of emotional imbalance. The reason this matters is because depression actually can result from multiple possible sources in your life. Acupressure and energy healing are likely to treat one of the sources, but not as likely to help other sources. I'll explain the details here. Depression typically comes in a few different varieties. There is the most severe type of depression, which is genetically-predisposed depression which is the result of faulty brain functioning. This type of depression, which is usually the most prolonged, probably won't be treatable with energy healing techniques. This is because the negative feelings are actually a result of a physical malfunction in your brain. While it's true that acupressure often relieves physical maladies, it isn't always effective. Trying to treat genetically-caused depression involving malfunctioning brain chemistry with acupressure may be like trying to regrow an amputated limb with acupressure. In other words, it's probably not going to be effective. In order to treat genetically-predisposed depression, it is advised that you rely on prescription anti-depressants as a first line of defense. However, there are other types of depression as well. There is a type of depression and emotional imbalance that is caused by improper diet. There is some evidence that a lack of proper micronutrients can cause temporary depression until the nutrients are restored in the body. There is also evidence that some people may suffer from emotional imbalance, including depression, from not regulating their sugar intake well. Some people suffer from what's called hypoglycemia, a condition caused by too much sugar intake which can cause depression in some patients. People who suffer from depression caused by an improper diet are unlikely to find full relief from their emotional problems just by using energy healing techniques like acupressure. It is important to address the problem at the source. Since the source of depression may be a bad diet, instead of an imbalance in meridian energies of the body, you may not find relief with acupressure for this type of depression. 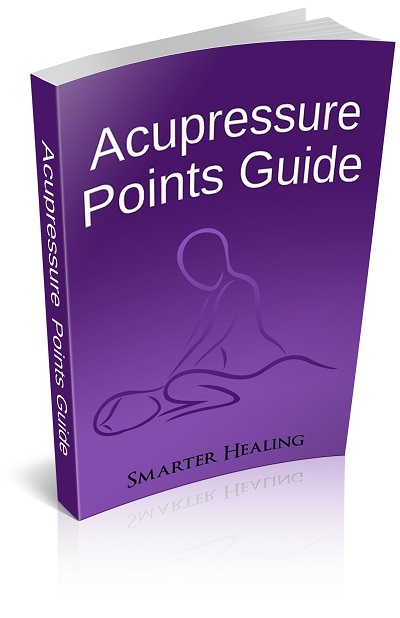 However, what is acupressure actually good for? Can we relieve any depression at all with it? Yes we can. That's because there is a third type of depression: psychological depression. This type of depression is caused purely by your mental reaction to the life circumstances around you. Psychological depression can range from severe extremes, such as becoming suicidal after the loss of a loved one, to mild encumbrances, such as becoming stressed and sad because your boss at work doesn't treat you with respect. The good news is that acupressure and similar energy healing techniques can work wonders on this type of depression. Energy healing of all sorts is highly effective at treating phenomenon in the body that is purely mental in nature, such as psychologically-based depression. By balancing the body's inner meridian energy flow, acupressure points can be utilized to get rid of psychological depression. Let's take a look at the proper points to use. 1. 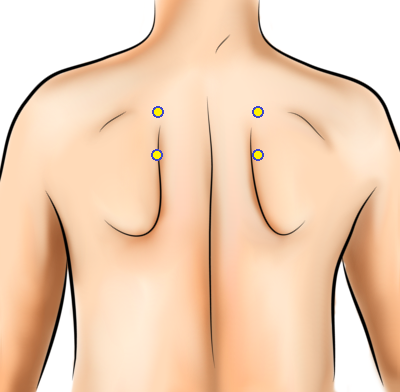 Bladder 38 (bottom point in image below), on the back, between the shoulder blade and the spine, at the same height as the heart. Note: Some academic sources number the points of the Bladder meridian differently. This is due to a disagreement in how to properly number the two separate spinal branches of the meridian. Don't worry though - the points themselves still remain the same. Just use the proper point location no matter what number is assigned to it. Use this potent acupressure point to balance all of your emotions. It will help relieve you of anxiety, sadness, and any other type of psychological distress. 2. Bladder 10, on the back of the head, half an inch below the bottom of the skull, half an inch to the side of the spine. This pressure point will rid you of emotional distress of all kinds. It will restore your energy and relieve you of emotional burnout and physical exhaustion. This acupressure point is good for treating psychological depression. It will also reduce a heaviness feeling in the head which is often caused by emotional distress and sadness. 3. 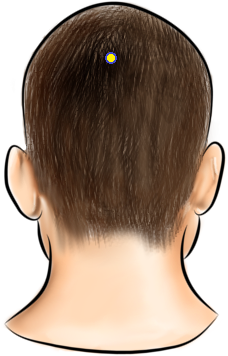 Gallbladder 20, on the back of the head, right below the bottom of the skull, about an inch to the side of the spine. 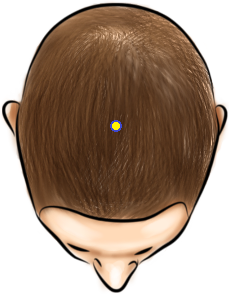 This is another pressure point that will help reduce pretty much all negative emotions in your mind. It is also very effective at reducing depression and heaviness in the head. This point will help restore your physical and emotional energy and thus relieve exhaustion, both physical and mental. 4. Governing Vessel 19, Governing Vessel 20, and Governing Vessel 21, all found along the top of the head, right in the middle of the skull. Use these Governing Vessel meridian points all in a row to relieve your mental depression. These points are also effective at reducing headache pain, reducing the effects of vertigo, and even improving the function of your memory. 5. Kidney 27, located on the front of the chest, in between the top rib bone and the collarbone. Use this powerful acupressure point on your chest to relieve all sorts of chest-related physical effects of negative emotions. This point will help reduce anxiety and depression. It will also help get rid of chest congestion, breathing difficulties, asthma, coughing, sore throats, and premenstrual tension. 6. 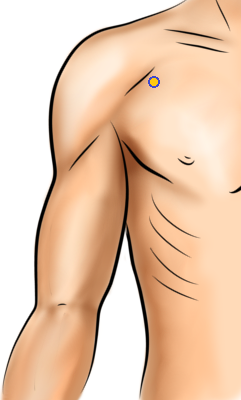 Lung 1, on the chest near the shoulder, located four finger widths above the armpit crease while the arm is down. This acupressure point will help relieve depression and general sadness, and open up repressed emotions. It will also help with lung-related physical conditions, such as shallow breathing (often a symptom of grief), chest tension and congestion. It can also help with coughing, asthma, and skin conditions. 7. 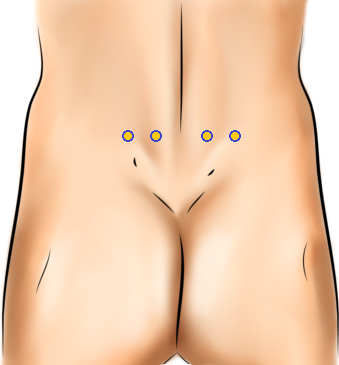 Bladder 23, and Bladder 47, adjacent to each other, found on the lower back at the waist level, two and four finger widths (respectively) to the side of the spine. These pressure points on your back will help reduce depression, traumatic emotions, and fear. They can also help restore energy and reduce emotional fatigue and physical exhaustion. 8. Governing Vessel 24.5 (between GV24 and GV25), on the face, above the nose, directly between the eyebrows. 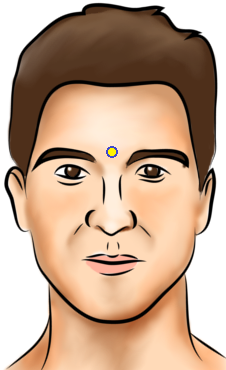 While not considered a traditional acupuncture point, this spiritually famous location of "the third eye" found between two acupuncture points can be used for acupressure anyways. Use this pressure point to relieve the sadness of depression. It can also help restore glandular imbalances in the body, as well as reduce emotional imbalances in general. 9. Conception Vessel 17, in the center of the chest, located three thumb widths above the bottom of the breastbone. This acupressure point will reduce the effects of many negative emotions. It will help sooth nervousness, sadness, depression, hysteria, and any other type of emotional problem in the mind. It can also help reduce chest congestion. 10. Stomach 36, located on the lower leg, exactly four finger widths below the kneecap. This point will help strengthen the entire body and empower the musculature system. It will help balance all emotions in general, restore energy and relieve fatigue. This empowerment of the body and mind helps to counteract all negative emotions, including depression.